since first reading about the doughnut vault in june of 2011, the place has been penciled into every chicago trip since, but unfortunately has always been skipped over in favor of sleeping in. this time i was determined to not let history repeat itself, and even made sure to take it easy on the drinks the night before and turned in for the night earlier than normal so waking up at 7:30am wouldn't be an issue. the doughnut vault is the creation of chef/restauranteur brendan sodikoff, a former french laundry cook and lettuce entertain you test kitchen adviser who is also responsible for gilt bar, maude's liquor bar, and au cheval. 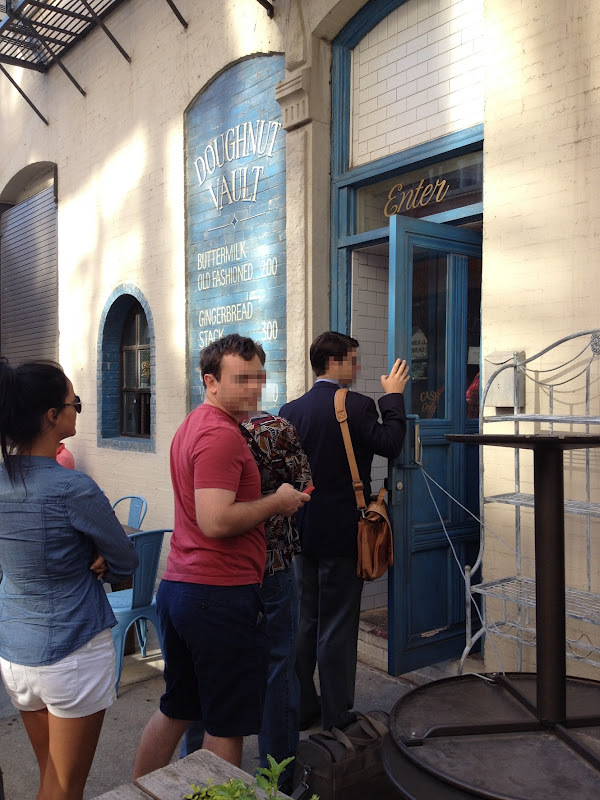 having recently been named number one on food and wine's list of america's best doughnuts, the vault is known for its long lines and typically sells over 1,000 doughnuts between the hours of 8:30am and 11:30am. carrie and i arrived at the small shop at around 8:15am and were happy to find that the vault had already opened for business and the line was only about twenty people deep. after only waiting for maybe fifteen minutes, we had our doughnuts and coffee and made the mile long trek back to our hotel eager to finally taste these famous rings of fried dough. coming in at $3 per doughnut ($2 for the old fashioned) the vault is more expensive than one might typically expect to pay for doughnuts, but the product is infinitely better. overall, i am happy to say that the doughnut vault easily lives up to its considerable hype, and would definitely recommend it to anyone looking for a sugar rush taken to the next level!